In 1812 Captain William Becknell, who had been on a trading expedition to the country of the Comanche in the summer of 1811, and had done remarkably well, determined the next season to change his objective point to Santa Fe, and instead of the tedious process of bartering with the Indians, to sell out his stock to the New Mexicans. Successful in this, his first venture, he returned to the Missouri River with a well-filled purse, and intensely enthusiastic over the result of his excursion to the newly found market. Excited listeners to his tales of enormous profits were not lacking, who, inspired by the inducement he held out to them, cheerfully invested five thousand dollars in merchandise suited to the demands of the trade, and were eager to attempt with him, the passage of the great plains. In this expedition, there were thirty men, and the amount of money in the undertaking was the largest that had yet been ventured. The progress of the little caravan was without extraordinary incident until it arrived at “The Caches” on the Upper Arkansas River. There, Becknell, who was in reality a man of the then “Frontier,” bold, plucky, and endowed with excellent sense, conceived the ridiculous idea of striking directly across the country for Santa Fe through a region absolutely unexplored; his excuse for this rash movement being that he desired to avoid the rough and circuitous mountain route he had traveled on his first trip to Taos, New Mexico. His temerity in abandoning the known for the unknown was severely punished, and his brave men suffered untold misery, barely escaping with their lives from the terrible straits to which they were reduced. Not having the remotest conception of the region through which their new trail was to lead them, and naturally supposing that water would be found in streams or springs when they left they neglected to supply themselves with more than enough of the precious fluid to last a couple of days. At the end of that time, they learned, too late, that they were in the midst of a desert, with all the tortures of thirst threatening them. Without a tree or a path to guide them, they took an irregular course by observations of the North Star, and the unreliable needle of a pocket-compass. There was a total absence of water, and when what they had brought with them in their canteens from the river was exhausted, thirst began its horrible office. In a short time both men and animals were in a mental condition bordering on distraction. To alleviate their acute torment, the dogs of the train were killed, and their blood, hot and sickening, eagerly swallowed; then the ears of the mules were cut off for the same purpose, but such a substitute for water only added to their sufferings. 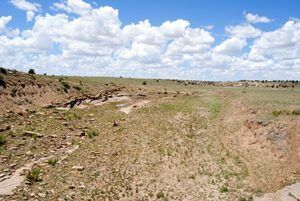 Although they were near the Cimarron River, where there was plenty of water, which but for the affair of the buffalo they never would have suspected, they decided to retrace their steps to the Arkansas River. 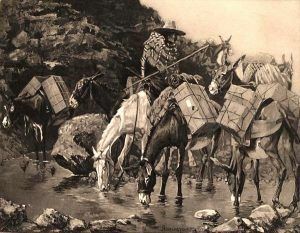 Before they started on their retreat, however, some of the strongest of the party followed the trail of the animal that had saved their lives to the river, where, filling all the canteens with pure water, they returned to their comrades, who were, after drinking, able to march slowly toward the Arkansas River. Following that stream, they, at last, arrived at Taos, having experienced no further trouble, but missed the trail to Santa Fe, and had their journey greatly prolonged by the foolish endeavor of the leader to make a shortcut. As early as 1815, Auguste P. Chouteau and his partner, with a large number of trappers and hunters, went out to the valley of the Upper Crossing for the purpose of trading with Indians, and trapping on the numerous streams of the contiguous region. The island on which Chouteau established his trading-post, and which bears his name even to this day, is in the Arkansas River on the boundary line of the United States and Mexico. It was a beautiful spot, with a rich carpet of grass and delightful groves, and on the American side was a heavily timbered bottom. While occupying the island, Chouteau and his old hunters and trappers were attacked by about 300 Pawnee Indians, whom they repulsed with the loss of thirty killed and wounded. These Indians afterward declared that it was the most fatal affair in which they were ever engaged. It was their first acquaintance with American guns. The general character of the early trade with New Mexico was founded on the system of the caravan. She depended upon the remote ports of old Mexico, where was transported, on the backs of the patient burro and mule, all that was required by the primitive tastes of the primitive people; a very tedious and slow process, and the limited traffic westwardly across the great plains was confined to this fashion. At the date of the legitimate and substantial commerce with New Mexico, in 1824, wheeled vehicles were introduced, and traffic assumed an importance it could never have otherwise attained, and which now, under the vast system of railroads, has increased to dimensions little dreamed of by its originators nearly three-quarters of a century ago. 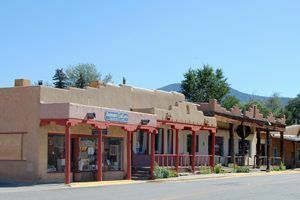 It was eight years after Pursley’s pilgrimage before the trade with New Mexico attracted the attention of speculators and adventurers. 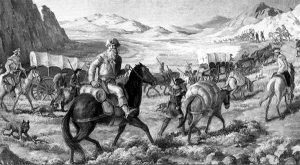 Robert McKnight, James Baird, and Samuel Chambers, with about a dozen comrades, started with a supply of goods across the unknown plains, and by good luck arrived safely at Santa Fe. Once under the jurisdiction of the Mexicans, however, their trouble began. All the in the party were arrested as spies, their wares confiscated, and themselves incarcerated at Chihuahua, where the majority of them were kept for almost a decade. Beard and Chambers, having by some means escaped, returned to St. Louis in 1822, and, notwithstanding their dreadful experience, told of the prospects of the trade with the Mexicans in such glowing colors that they induced some individuals of small capital to fit out another expedition, with which they again set out for Santa Fe.